In today’s world of Software Asset Management, we have long been distracted by managing the Intellectual Property (IP) asset owned by the software publisher rather than managing and optimizing the software license entitlement asset owned by the customer. There is one simple habit practiced by the vast majority of software asset managers today that causes more confusion about software asset management (SAM) than any other activity. Instead of noticing that there are two assets, the intellectual property (the software) owned by the software publisher and the distinctly separate entitlement (the license rights) owned by the customer, many IT managers think of the software “asset” in a singular way – as only one asset. Why do we call the installed software an “asset” and how has this definition impacted industry attitudes about software licensing? Of course the software is an asset. It is an Intellectual Property (IP) asset that belongs to the software publisher – and not to the customer – and in most cases will always belong to the publisher. Further, the publisher, driven by an interest in protecting their IP asset, has prescribed a set of common practices for customers that are designed to protect the publisher’s asset. But who is protecting the value of the entitlement asset owned by the customer? The answer is simple; unless the customer is, no one is protecting it. I’m not saying that IT departments haven’t been managing license entitlements at all. It’s just that our predisposition, our primary focus, has been directed so forcefully toward intellectual property protection for so many years, that we often don’t apply ourselves effectively to the task of optimizing software license entitlements for cost reduction. I have taught for many years that customers must move beyond conventional (audit-based) SAM and focus on managing entitlements. A simple way to conceptualize this is to understand the flaw in the mantra that tells us “If it is installed, I need a license for it”. When we live by this mantra we pay no regard to whether we need the software that is installed. The IT department simply renews annual contracts without clearly examining demand. So we must turn the model around, and instead of buying licenses to cover installed software, we must manage installed software to meet usage demand. This practice is sometimes referred to as “Optimized SAM”. Optimized SAM is a management philosophy that is focused on reaching an ‘optimal’ point of balance between over- and under-entitlement. The goal is to ensure that customers neither purchase too many, or not enough, software licenses. But I prefer to describe the practice as “Entitlement Centric SAM”. Entitlement centric SAM is a management approach that recognizes that the true value of software (to the customer) is in its entitlement, which is owned by the customer, and not merely in file existence; the IP asset owned by the publisher. When we focus on the demand for entitlements (use of the software IP) then we break the habit of blindly licensing all of our installations without first asking whether they are even needed. We can compare the two approaches; “Conventional SAM” and “Entitlement Centric SAM”, by examining the differences in the basic license compliance model used by IT departments for over 20 years. Conventional SAM practices seek compliance first through application of a traditional five-step model. – Our goal at Step #3 is compliance. Conventional SAM is not effective for software license optimization and cost reduction for several reasons. First, conventional SAM has a predisposition for file existence as licensing metric. It focuses first on gaps in deployment vs. entitlement under the mantra: “If it’s installed, I need to license it.” Conventional SAM is also not sensitive to trial/demo copies that do not even need entitlements. Usage and demand for software is initially ignored and might never be examined. And to the extent that usage analysis is delayed, license optimization and cost reduction is also delayed. If we adjust the traditional management model however, and move toward entitlement centric SAM, our practice model looks like this. Entitlement centric SAM has many advantages. By changing the initial target to include both compliance and cost reduction we are able to experience return on investment (ROI) much sooner. Compliance is not sacrificed when optimization and cost reduction are emphasized because we still do everything we would do under conventional SAM. Under Entitlement centric SAM, we add tracking of entitlements and usage. And compliance comes along for the ride. In our entitlement centric model above, we begin tracking usage in Step #1. This helps us to understand demand for licensing which will pay off in cost savings in a later step. We also add “Active Management Policies” which gives us a way to reconcile purchased license entitlements with our license policy management, and not just with installations. This gives us the unique ability to measure deployment and consumption of entitlements instead of just deployment of software – another step that will pay off in cost savings. Click here to read more about purchased entitlement reconciliation. Step #3 from the conventional model is modified to reconcile purchased entitlements with policy management instead of with installed software. In Step #4 we adjust deployment and licensing levels to meet demand and this is where we take the conventional step of reconciling installed software inventory with purchased entitlements. The net result: we reach optimization, cost reduction and preliminary compliance at Step #3 and demonstrate compliance at Step #5. Entitlement centric SAM is especially effective in Virtual and Cloud Computing environments. Conventional audit-centric SAM becomes inadequate when the IT ecosystem is constantly changing, or when entitlements are subscriptions, or when software executables are not installed, and thus not discoverable. Under Cloud Computing models, compliance management becomes a non-issue because the software vendor often controls compliance. This actually benefits the customer by freeing up the IT asset manager’s time to focus more attention on license optimization and cost reduction. Here are a few simple examples of how Entitlement Centric SAM has been effective for Sassafras K2 customers. One customer, who was licensed for 350 copies of Adobe Acrobat, learned that only 238 computers used the software over a measured six-month period. That translates to 112 unused licenses. At roughly $390 a pop, that represents a lost savings opportunity of $43,680, and a potential savings opportunity going forward. 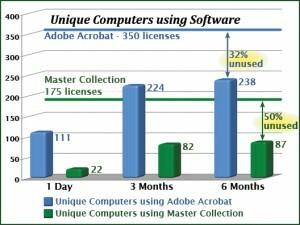 The same customer was licensed for 175 copies of Adobe Master Collection but had used only 87 – less than 50%. At roughly $2,560 each through volume purchase licensing, that’s an over-spend of $225,280. Another example comes from a customer who analysed usage for six site licensed software products. Each product was licensed for use on the 5,500 computers at their organization. Over a period of six months, two of those products were utilized on 4,217 and 4,394 unique computers respectively. One product was significantly underused. It was only launched on 199 unique computers – just 3.6% of the licensed computers. Each of the remaining nine software products were used on six or fewer computers each over six months. Needless to say, that customer replaced many of their site licenses with less expensive licensing options for the same products going forward. Need help with reducing IT costs? 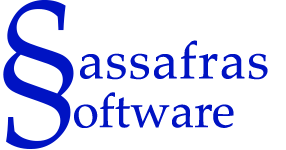 If you have questions about how to improve your software/hardware cost reduction efforts with K2, feel free to contact me for assistance. I can look over your configuration and assist you with configuring K2 to reach your IT Asset Management (ITAM) goals. Coming up in this series, I will examine how to identify target software for license optimization, how to get started with cost reduction, and how to effectively negotiate changes in software licensing with publishers. Penn State purchased Sassafras KeyServer (now Sassafras K2) in the early 90’s with the sole intent to be legal with respect to software utilization. But it wasn’t long before we realized the potential for KeyServer to save money. The first of what I like to call ‘The KeyServer Advantage’ came about when we learned that one of our freeware applications was going to cease development. To make matters worse, the existing version of the freeware program wouldn’t work with the new Mac OS version we were about to deploy. Our only alternative was to migrate users to a new, commercial application. Since we had used KeyServer to monitor the usage of the soon-to-be-dead freeware program, we knew precisely how many copies of the commercial app we needed to purchase. Had we not had the KeyServer Usage History, we likely would have purchased many more copies than would have been necessary. This was the first of many times that KeyServer would save us money. Every three months (each semester) we would use KeyServer Usage Reports to review our software utilization. Then, each year when it came time to upgrade software, we could purchase just the right number of software licenses of each application required. A prime example of how KeyServer allowed us to save significant dollars was when it came time to renew our Adobe software licenses. Because of the high cost of Adobe software, and the even higher cost of concurrent licenses, knowing the usage of the Adobe programs from semester to semester and year to year allowed us to purchase only the number of licenses needed. I’m sure this saved us tens of thousands of dollars over the many years of software purchases. More likely, tens of thousands of dollars each year! I hope your article makes your current customers think more about the KeyServer Advantage and how monitoring software utilization (in addition to deployment) can help save money. I also hope your article helps bring in new customers. Because, from my experience, every Sassafras customer is a happy customer. And the world can always use more happy people! the processes that you identify under “Entitlement Centric SAM”. entitlements will achieve reduction of software costs. seamlessly incorporate them to provide a complete SAM solution. First great article and commentary. Solid points on software usage and impact on on premise assets. Cloud based solutions are only that simple if the software providers (Software as a Service) solutions are being used. That would not be the case for leveraging Infrastructure as a Service (Amazon for example) and there are many more considerations that need to be thought through in those scenarios. Many times the IT Staff is installing applications in 3rd party IaaS providers without knowing whether their license entitlement allows them to do so creating additional risks of being out of compliance with their entitlements -particularly if they are based on installed versus usage and proving whether it is test/dev or actual production usage. My new book iSpeak Cloud (coming out early in 2014) goes into economics of Cloud that may be useful to this audience as well. There are many other considerations around the hidden costs of cloud, hitting law of diminishing returns (when SaaS or IaaS may exceed on premise costs) and additional benefits to consider that would result in impacting overall company’s profits and loss statements (versus typical cash flow) that should also be considered when identifying SAM Policies. It’s refreshing to see that a software developer actually listens to their clients! Way to go. Tell the team thank you.